Who wrote the Canterbury Tales? Of course Chaucer did, and anyone who thinks otherwise is simply being ridiculous (and here I am not in any way referring to the many attempts after his death at continuing or finishing the Tales, but solely the unfinished ones that are undoubtedly attributed to him), but I mean, who actually did the physical writing, and more importantly, what role did they play in the final arrangements of the Tales? Once the hand written Tales left Chaucer’s desk, during his final days, or shortly after his death, they were left to interpretation and editing. Most scholars working with the manuscripts will be faced with the challenge of tale ordering, as all extant manuscripts, even Ellesmere (most anthologized and found in the Riverside Chaucer and the Norton that every student uses), is fragmentary. The problem, however, goes beyond simple tale ordering into the actual fragments, that through the numerous transcripts (84 known) become practically untraceable. There is little question in regards to Fragment I, consisting of the General Prologue, and Fragment X with the Retraction, but the middle has yet to be indisputably defined. While different manuscripts rearrange the tales in accordance to theories formed on how the tales should interact, it is important to note who wrote these manuscripts. What evidence is there that any one manuscript accurately replicates authorial intent? As will be noted throughout my exercise here, and what was once noted after reading the Manly-Rickert volumes, analyzing the manuscripts and digging up information leads to more questions than answers. Not only are some individual tales left unfinished, but the entire work as we have it, even when conflating different versions, is not even remotely complete, and is a small part of a much larger work. So the puzzle is not simply to decipher which works went where, but to anticipate/guess/conclude/(include several more adjective here) what might have been included in between. The focus can become contextual, in which the relationship between pilgrims establishes the order, in accordance to several factors, including estate, proximity, or personal knowledge based on what is already written. Or the focus may become geographical, insinuating that different tales take their order from the cues of their surroundings (promulgated by Bradshaw and brilliantly and wittily disproved by Donaldson). Others focus on a timeline of when each manuscript could have possibly been written. However, each of these theories has its flaws that impede the assertion of any one dominant ordering to end all further discussion. The idea that the tales proceed down a narrative arc built on spirituality falls short when considering that there is no definite structure that leads to spirituality from beginning to end, meaning that the tales waiver along a line that approximates spirituality, but not quite. The idea that the tales trace the relationships between pilgrims is questionable in light of the fact that not many are actually made, and the pilgrims spend the majority of their time telling tales or talking about themselves as opposed to actually interacting with each other. The Bradshaw Shift rearranges the entire work in light of a few geographical references. If such a far fetched theory could exist, then it is important to note that it does not take into account that in the General Prologue (which almost doesn’t vary at all throughout the manuscripts) it is stated that there would be a return trip – geographically this should be taken into consideration, ultimately serving to reverse the tales altogether. As Donaldson states, the Bradshaw Shift is “a desperate remedy, a huge conjectural emendation involving the transfer of some 3450 lines over an area of 7326 lines in order to correct the reading of a single word.” In other words, if the tales did follow a geographical pattern as they are, it would be the equivalent of driving from Los Angeles to San Francisco, with a stop in San Jose only to back track to Santa Barbara before resuming the northern route. Not to mention that, again, the Tales are not complete, meaning that further changes could have been made, and more importantly, if topography was so important to Chaucer, then why are there so few references to it? Sittingbourne and Rochester constitute almost half the geographical mentions made. This leaves two ways of analyzing the manuscripts, contextually, and physically. To more or less paraphrase Helen Cooper, since theories based on identifiable connecting ideas are subject to interpretation, editors generally take a more technical, or textual, approach that is based on physical evidence within the manuscripts, helping to deduce the hands which actually wrote the Tales, and bringing the work closer to the nature of how Chaucer left it. Arguably (although no one argues against this), one of the most important texts in Chaucer scholarship is the 1940 Manly-Rickert eight volume set that analyzed all extant manuscripts at the time, line for line, noting all discrepancies, and forming decisions which would sway scholarship for decades into the present. 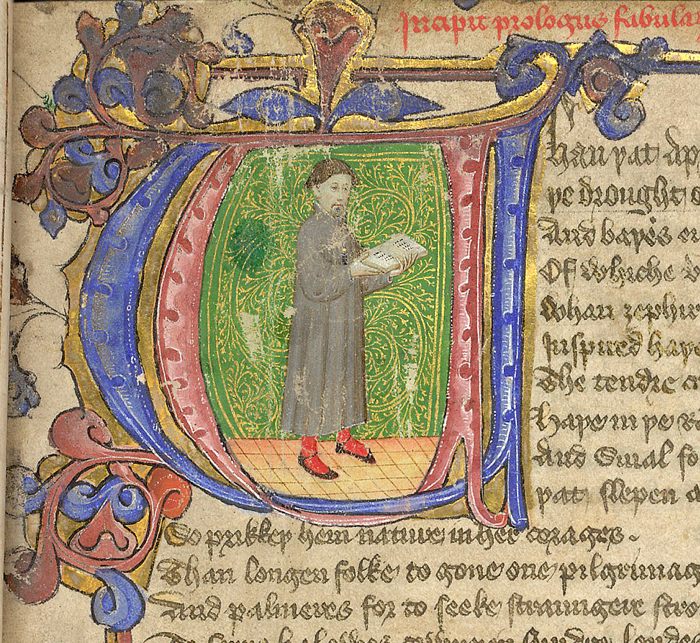 Unlike the majority of scholars, they did not believe Chaucer had a set idea before death, and that the manuscripts were all inferences of his work. I personally believe much the same, and have quite a hunch that authorship was greatly represented by scribal authority, especially when scribes of myriad notable texts (noted for their penmanship and ink preferences) had their hand in completing manuscripts. The Manly-Rickert text asserts that upon Chaucer’s death scribes acquired the Tales from his desk, and from circulation among acquaintances, referring to these pieces as “corrupt” due to previous handling. However, what this suggests is that scribes received the Tales piecemeal, and therefore not in any intelligible order. The main problem with this is that a large number of manuscripts do preserve a certain order. Granted several of the same scribes worked on several of the same manuscripts, meaning that they would have preserved the order among themselves, this does not account for the overall consensus on certain groupings. Over 50 manuscripts maintain the marriage group, as it is modernly called. And even more convene on the primary tales. It would have been impossible for only a handful of scribes to have completed these works in a life-time, not to mention the disparity of libraries in which they were found makes it unlikely that communication happened, implying that there was in fact some sort of predetermined order that all were following, with only slight divergence, making the problem somewhat easier to solve – the tales are typically found in groupings, so it is not the original tales that must be placed in order, and not even the fragments, but rather the groupings. This same argument will again become important shortly. All of the manuscripts that contain a full set of fragments (ten), are dated after 1400, meaning nothing was written during Chaucer’s life, and thus he had no hand in scribal orchestration. More recent studies, notably those of Vance Ramsey, speculate that the Hengwrt manuscript was in fact produced before Chaucer’s death, circa 1395. The significance is within the implication that if Hengwrt was produced directly under Chaucer’s guidance, or at least with his general approval, then the tale orderings in Hengwrt hold more authority than previously conceived. Manly and Rickert were of this view before Ramsey made the argument, however, they did not acknowledge any claims of Hengwrt being produced prior to 1400, but rather that it “represents the earliest attempt after Chaucer’s death to arrange in a single manuscript the tales and links left unarranged by him.” Yet, according to the ordering that Manly and Rickert devised, Hengwrt is lacking passages, and reverses several folios later found in other manuscripts. Yes, Hengwrt is indeed lacking passages, especially in light of the Lansdowne and Ellesmere manuscripts. Yet regardless of whether Hengwrt was written before or shortly after Chaucer’s death, to refer to it as one of the closest manuscripts to Chaucer’s desk implies that anything outside Hengwrt was perhaps a scribal embellishment to fill in numerous gaps of plot. Considering who is thought to have been the principle scribe on the Hengwrt and Ellesmere manuscripts, it does not seem impossible, but considering that even the Ellesmere remained incomplete it begs the question as to how much involvement there really was. Depending on which passages are thought to have been fabricated for plot continuation, and the amount of added material, readings could most certainly be altered. Cooper has thoroughly discussed the absurdity of trying to reassemble what may at one point have been on Chaucer’s desk in an attempt to reconstruct the original intentions for the manuscripts. Aside from that information being unavailable, it generally leads to a circular argument where people will find on the hypothetical desk whatever it is they wish to find there, then use their hypothetical answers to argue their interpretations of the text, and use the text as proof for their assumptions. In most simplistic terms, the textual problem faced is akin to the “which came first, the chicken or the egg?” conundrum. Since tale ordering is apparently important enough for so many scholars to have been discussing it for nearly the past century, it only follows that most would want to know how the selection process was made for the Tales. The individual tales were obviously not written in the order in which we have them, regardless of manuscript, otherwise we would have one long line of tales, with nothing to debate. This is not the case, meaning the they were written individually, separately, meant to be later assembled like puzzle pieces. The puzzle, however, lacks an unbelievable amount of pieces, not just in unfinished tales, but further in the discrepancy between what is stated as the goal of the journey in the General Prologue, versus what is actually had. Was there supposed to be even more in the middle? The Tales were largely influenced by the Decameron, contextually, like the Clerk’s Tale that is pretty much a verbatim retelling of Petrarch’s translation of one of the stories from Book X, and more importantly, stylistically. However, Chaucer complicated the concept. Whereas the narrative of the Decameron, and pretext of the black plague is present only to loosely tie the stories together, in the Canterbury Tales the interlinking monologues, discussions, and character sketches are formed to be just as, if not more important than some of the tales. Thus a reading of the Canterbury Tales and subsequent discourse on tale ordering must take into consideration the implications of narrative when moving the tales around (i.e. the Clerk’s Tale can never precede the Wife as the tale responds to the Wife’s Prologue, or the Reve must follow the Miller since the Reve’s Tale responds to the Miller’s). However, it is not always certain how closely they must follow one another. Can several tales intervene between? According to most manuscripts, the answer to this is yes. Are there other prologues that also make mention of these tales which will indicate an even more complicated ordering? Sometimes. And most importantly, who made the final decision? As mentioned before, there is a thread of scholarship that believes the Hengwrt manuscript to be the most authentic, as in closest to Chaucer’s intentions since it was produced closest to his death. Some more extreme scholars believe that the manuscript was found in his desk at time of death, which is not as well accepted, mainly because most proof they provide is largely unacceptable. It is, nevertheless, widely accepted (with valid proof provided), that the same scribe who created Hengwrt was also responsible for the Ellesmere, which places the Hengwrt manuscript as a prototype for the Ellesmere, making the latter into a “new and improved” version. Thus it can be inferred that what is in Hengwrt was whatever was found or already acquired from Chaucer at his death, while the Ellesmere may either provide new materials that came to light after the fact, or scribal interpretation of ordering and tale finalization for continuity – either theories are feasible, and both just as likely. M. C. Seymour explores and refutes both of these, focusing on the work of N. F. Blake, discussing three underlying premises of Blake’s original argument that were never overtly stated, but which Seymour believes were the crux of Blake’s argument. First Seymour explains the implications of Blake’s argument that the poem was not simply unfinished and abandoned, but that Chaucer was still working on it until his death. The main point relies on the Retraction attached to the Parson’s Tale. Seymour argues that since the Retraction exists, Chaucer had a plan for how the Tales would proceed to the end. However, having written the Retraction does not necessarily preclude him from having (at least temporarily) abandoned the Tales. Then Seymour addresses the ongoing debate about the unfinished Squire’s Tale, which in his opinion is indefensible; it is not unfinished, but was meant to be interrupted by the next story teller (in most manuscripts, by the Franklin). Lastly, Seymour analyzes why certain tales (Cook’s Tale, Merchant’s Tale, Monk’s Tale, etc.) were thought to be unfinished, having to do with the spacing on the manuscripts, missing leaves, and later additions in different inks. The manuscripts which are thought to have been created the earliest have spacing that later manuscripts do not have, meaning that during the scribal process of the “prototype” manuscripts the scribes may have been waiting to either find or receive the missing pieces. Once enough time passed to where it was no longer feasible that they would turn up, the subsequent manuscripts omitted the spacing altogether. Or, as in a few cases, there were parts written in to fill the spaces that were obviously added later either in different inks, or by a completely different hand. Some are strictly Chaucerian, and have for the most part been authenticated, while others, like Gamelyn are often questioned and not included in most compilations, although some manuscripts have it following the unfinished Cook’s Tale. All three of Blake’s premises, as Seymour outlines them, rely on the concept of the contents within Chaucer desk. Again, trying to ascertain what was there leads nowhere, so even though the Hengwrt may have been the earliest manuscript of the Canterbury Tales created, it is not necessarily the most authoritarian. Returning to the contextual argument, and revisiting the idea that there were in fact two trips planed (to and from Canterbury), it is difficult to decipher which tales were meant for which trip. In fact, it is impossible to make any concrete decisions on this. Thus it is best to focus on the tales existing within a single trip. This is not to say that that is how Chaucer intended it, however trying to figure out his intentions would be as lucrative as unearthing what may have been on his desk. It has been argued that the way the tales are now is due to scribal attempts at organizing the few tales that were found. Yet the very fact that all manuscripts arrange the tales in a single journey out suggests that their orderings are related. There are different fragments which are consistent throughout the manuscripts, once again indicating that if all the scribes had acquired the tales individually and no evidence existed for an ordering, then the consistencies would not exist. In other words, as logical as some fragments may appear, for all the manuscripts to reach the same conclusion independently, without previous instruction, in unlikely. To get a better sense of the process of tale ordering, the logistics of it can be traced between the Hengwrt and Ellesmere manuscripts (and in future revisions of this I will expand on several other manuscripts, including Lansdowne, Harley, and Corpus Christi). The Hengwrt allows for a mixture of scribal and authorial intents to be measured – it appears that in the Hengwrt manuscript the scribe copied the pieces he had without making connections between the tales. They were separate pieces simply written to be later assembled. These same pieces were recopied in the Ellesmere manuscript, somewhat rearranged, and polished. Something happened in between the creation of these manuscripts that prompted the changes, and finding that information would elucidate the extant of scribal intervention within manuscript creation. I was currently in the middle of outlining some clearer distinctions between the manuscripts with a breakdown of scholarship in existence along with my own commentary, however, I will have to stop here for tonight. I would have had a bit more, except my Hengwrt/Ellesmere digital facsimiles were not cooperating with me last night. The CD Rom was being finicky, and the Aberystwyth Library site was not linking properly. So basically I spent most of last night staring blankly at my laptop. I will consider this Part I, and will have Part II up at some point this week.